Stonehenge- even after centuries of investigation, continues to fascinate and generate countless theories about who built it, how was it built and, perhaps the most intriguing - why was it built? 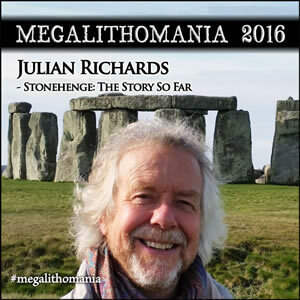 I this talk archaeologist Julian Richards will trace the development of our current understanding of Stonehenge, introducing some of the latest archaeological ideas and suggesting ways in which future research might answer some of our questions. Just don’t expect all the answers. 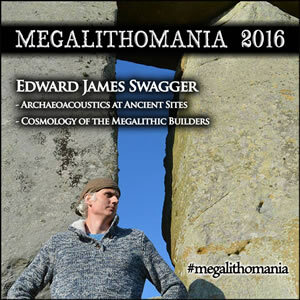 There are many ancient megalithic sites on the planet which conventional academics try to, but can not explain. At the top of this list would be Peru, Bolivia, Egypt and Lebanon, where ancient works were achieved using technologies far beyond the capabilities of such people as the Inca and dynastic Egyptians, and in some cases beyond our present abilities. 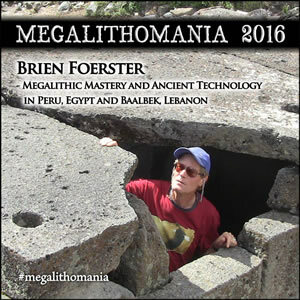 In this talk, Brien Foerster will show you many examples of lost ancient high technology from the distant past, will theorize what these technologies may have been, and the possibility that an ancient global cataclysm wiped out those that had made them. After completing an Honours Bachelor Of Science degree, Brien took up traditional wood carving and sculpture at the age of 25. In 1995 he moved to Maui, Hawaii, and was hired as assistant project manager for the building of the 62 foot double hull sailing canoe (ancestor of the modern day catamaran) Mo’okiha O Pi’ilani (Sacred Lizard That Pierces The Heavens.) Peru became his next major area of interest, where he has been researching the elongated skull phenomenon and the pre-Inca megalithic sites for a decade. Brien is a regular on History Channel’s Ancient Aliens and leads annual tours to South America with Megalithomania. Brien has been made the cultural ambassador for the municipality of Paracas, and has written several books on ancient Peru and the Pacific & co-authored with David H Childress. Stonehenge–how was it built, why was it constructed and who built it– are three fundamental questions that have never been fully answered. Maria will focus on one important question: who built Stonehenge. She recently discovered that the Neolithic people of Stonehenge had elongated skulls. They resided and ruled in the Stonehenge environs for nearly 2000 years and raised elongated monuments that were the largest constructs in prehistory. They appear to have established a Goddess Cult and then suddenly genocide took place. These enigmatic and peaceful people were murdered and this factual evidence has gone by unnoticed for over 5000 years. This presentation is dedicated to their story and untold history. Ancient civilizations recognized that the Earth emits harmonic energy. Pyramids, stone circles and temples marked these special locations creating a striking beauty and terrestrial harmony. Separated by thousands of miles, monumental sites were connected by magnetic lines of force streaming over the surface of the Earth. Prehistoric geomancers revered two types of powerful energy. One kind is associated with the earth and the other with underground water and both emit certain frequencies and colours which can influence a monument constructed above it. Maria will explore the hidden esoteric design canons of sacred sites, the invisible colour frequencies of earth and water and why our ancient ancestors revered them. In the 1930s, occultists, Katharine Maltwood (discoverer of the Glastonbury Zodiac) and Dion Fortune (author of many books on the occult) promoted aspects of the Triangle of Michael - Glastonbury Tor, St Michael's Mount in Cornwall, and Mont St Michel in France. Each of these places belonged to the Benedictine order of monks who appear to have had knowledge of 'lines of power' across the landscape of the British Isles and Europe. The three sides of this huge triangle project onwards creating 'the Great Dragon Line', The Michael Line (from Cornwall to the Norfolk coast); the Michael Apollo Line (down through classical Europe); and the Celtic, Lugh Line, that runs from the western isles of Scotland, through France and into the Pyrenees. 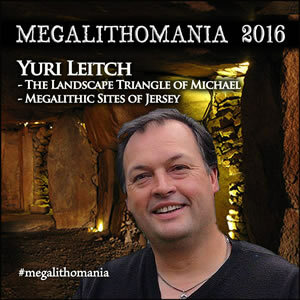 A non-stop introduction to the mysteries and megaliths of the Channel Islands; incorporating - Neanderthal caves; dolmens and menhirs; spectral black hounds; Puck and White Ladies; sacred springs and Druid Circles stolen from Jersey and rebuilt in Oxfordshire - not to forget a standing stone with breasts and the Devil's own hole! Yuri Leitch is a Glastonbury-based artist, writer and Psychic Quester. For many years he has researched the life and intrigues of the mystical sculptor, Katharine Maltwood, famous for her discovery of the Temple of the Stars (Glastonbury Zodiac. He is a major contributor to the book - The Signs and Secrets of the Glastonbury Zodiac (2013). Research of Ancient Acoustic Mysteries Will reveal the power Archaeoacoustics as a discipline can reveal about ancient sites. Megalithic Chambered mounds - Acoustic Chambers – Measurements, Research & Analysis Will discuss the concept of the Helmholtz resonator as a passage tomb layout. Geometry equals acoustic effects. Will show the deliberate design techniques of Hypogeums Acoustics, Altered States and the Power to Heal The benefits and effects of the chambers on the peoples who built them. Why was Avebury built where it is? With a stunning slideshow, Steve takes us on virtual tour of the Avebury area, exploring the relationship between the monuments and the natural features that influenced their siting. Steve’s many surprising discoveries include a network of previously unknown warm springs that are integral to Silbury and other monuments. The springs, and natural outcrops of huge sarsen stones, made this a ‘special place’ and may have attracted people to Avebury thousands of years before any construction began. Lecture 2: The John Michell Memorial Lecture, hosted by Christine Rhone - Voices of the Ancestors: Sounds of Prehistory. 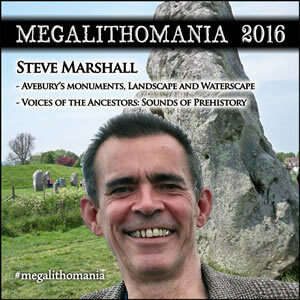 Steve Marshall introduces archaeoacoustics. Using a slideshow, video and surround sound, he shows how sound played an important role in the lives of prehistoric people. We hear musical stalactites that were played in a Spanish cave 27,000 years ago, and explore some of Avebury’s strange sound properties. Steve shows how the mystical bull roarer, probably the world’s oldest musical instrument, may have been used to resonate stone tombs such as long barrows, in mind-altering rites of initiation. Sound frequencies too low to hear may still be felt and can affect brainwave activity, producing ‘altered states’. The audience will be able to experience this for themselves, when Steve generates infrasound in the Town Hall! 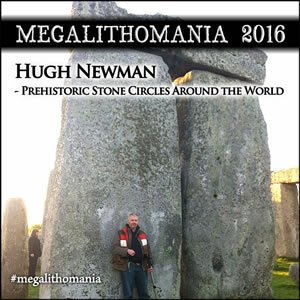 In this lecture, founder of Megalithomania and ancient sites explorer Hugh Newman, reveals how recent discoveries in Britain are confirming what Prof. Alexander Thom said all along - that stone circles are astronomically aligned, are part of a greater geodetic survey, encode sophisticated measurement systems, and were built using advanced geometry. Over 1000 stone circles have been recorded in Britain, but sites such as Gobekli Tepe in Turkey, Carahunge in Armenia, and Msoura in Morocco, are rewriting the dating and origins of the stone circle builders. These rings of stone have now been recorded worldwide, including in countries such as Peru, Argentina, North America, South Africa, Nubia, Gambia, Australia, Japan, France and across most of Europe (often called 'Cromlechs'). We will take a look at who may have built them, and why. The purpose of stone circles will also come under the spotlight in this presentation, as subtle earth energies, underground water, and unusual geology, as recorded by scientists such as John Burke, have been detected at these sites. The positioning of the sites in relation to other sites within the landscape, suggest their geomantic location was also an integral part of their design. Hugh will also look at the early theories, interpretations, folklore, and effects these circles have had on antiquarians, artists and researchers since they were put back in the spotlight by John Aubrey and William Stukeley in the 1600's and 1700's, with some of their early insights now being confirmed by modern science. 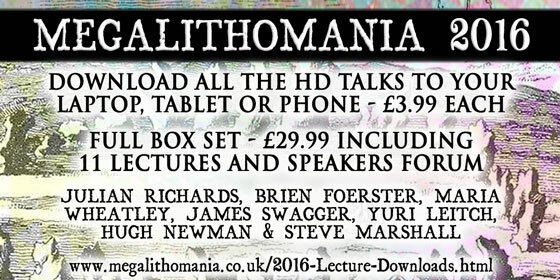 Hugh Newman is an author, conference organiser, world explorer, tour host, and Megalithomaniac. As well as organising the Megalithomania conferences, he has spoken at events in the UK, Malta, France, Peru, Egypt, Bosnia and North America. He has appeared on BBC TV, Sky Channel 200, Bosnian TV and the History Channel in the last five seasons of 'Ancient Aliens', and recently in 'Search for the Lost Giants'. He is co-author of 'Giants On Record' with Jim Vieira, and has published numerous articles. 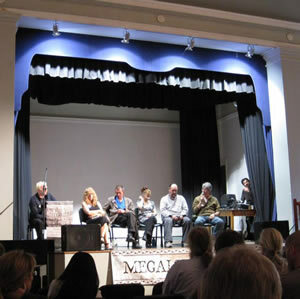 Including guest speakers Peter Knight and Christine Rhone. £25 inc entrance to Glastonbury Abbey and Chalice Well. 2.00 - 6.00pm. Meet in Glastonbury Town Hall Car Park. Walking tour to Chalice Well, Red & White Springs, Glastonbury Tor, The Egg Stone, Michael & Mary Lines, Glastonbury Abbey. £25 Includes entrance fees to Chalice Well & Abbey, with tour leaders Tor Webster and Shaun Kirwan. £45 inc coach. Lunch not included in price. Meet 9.15am in Glastonbury Town Hall Car Park. 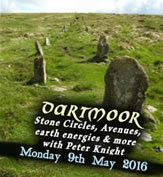 Peter Knight will guide us through the sacred landscape of Dartmoor, with sites including Merrivale Stone rows, and nearby Megalith and stone circle. We will then walk up to Great Staple Tor nearby, to look at the simulacra, the rock outcrops, to view other tors, and look down at merrivale to see its landscape setting; lunch at Princetown (there are several cafes and a pub), and then come back north via the Shovel Down stone rows and nearby Kestor, with its simulacra and rock basins. 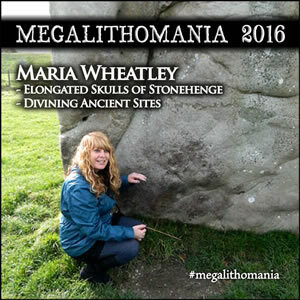 MEGALITHS & WATERWAYS OF AVEBURY AND ITS LANDSCAPE: 9.15am - 5.30pm. £45 inc coach. Lunch not included in price. Meet 9.15am in Glastonbury Town Hall Car Park. Maria Wheatley and Steve Marshall will guide us around Avebury Stone Circle, the stone avenues, Silbury Hill and West Kennet Longbarrow. Maria will show us the hidden energies of the landscape and Steve will give us insights and show us secrets of how the Avebury builders utilised water into the great design. He will also demonstrate acoustic experiments in West Kennet Long Barrow. We will get lunch at Avebury. Voices of the Ancestors: Sounds of Prehistory.